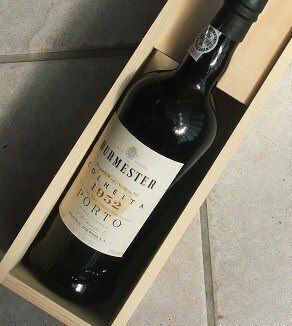 1952 Port wine Burmester Colheita packed in a wooden gift box. 1952 Port wine Burmester Colheita. This is a 1952. 65 year old Port wine of exceptional quality and elegance, a CASA BURMESTER classic that is made from a single harvest - a Vintage Tawny - aged in small 550-litre oak barrels in our Vila Nova de Gaia Cellar. The 1952 Colheita, bottled in November 2015, is a field blend coming in at 127.9 grams per liter of residual sugar. When people talk about old Tawnies being dried out, maybe they should taste this. Lush, surprisingly fresh and enticingly sweet on the finish, this is a rather elegant Burmester that is perfectly balanced and very friendly, yet nicely concentrated. It proves its age by the fine tension on the finish coupled with the complex medley of flavors that old Tawnies produce. The acidity gives this some life and vigor that many others do not have. It retains that classic, long finish. This seems so young and lively that it will be hard to stop drinking it. It doesn't immediately make you go "wow," but it is so easy to drink that you may not stop until there's none left. Burmester can trace their origins back to 1730, when Henry Burmester and John Nash founded a cereal trading company. After a move to Vila Nova de Gaia in 1750, the Burmester Port Shipping Company was born.